Irish PM hails his country's "quiet revolution"
That concludes our live coverage of the Irish abortion referendum results. 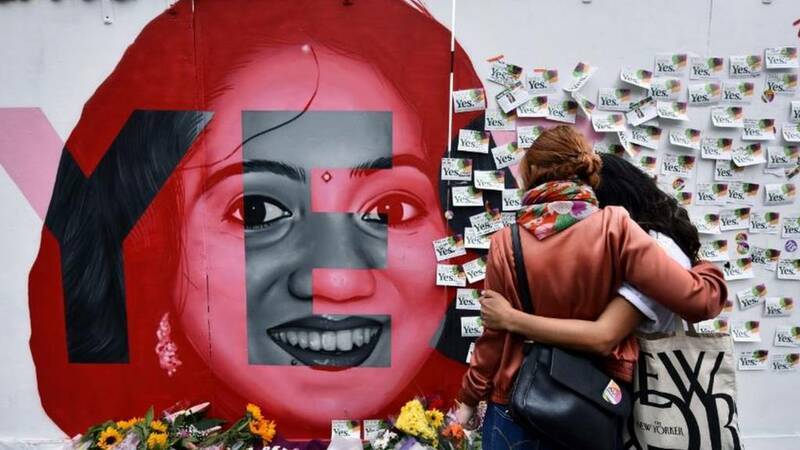 A day when the Republic of Ireland voted in favour of repealing the Eighth Amendment. Leo Varadkar in the aftermath of the result: "For me this is also a day when we say 'no more'. "No more to doctors telling their patients that there is nothing can be done for them in their own country. "No more lonely journeys across the Irish Sea. "No more stigma as the veil of secrecy is lifted and no more isolation as the burden of shame is gone." The crowds in the courtyard of Dublin Castle reacting to the official declaration of the referendum result. Returning Officer Barry Ryan delivers the results in Irish and English from Dublin castle..
Three constituencies yet to declare: Cork East, Donegal and Leitrim-Sligo but the maths are clear: the Yes side has won this referendum by a substantial majority. Dawn McAvoy from the anti-abortion group Both Lives Matter said: "We mourn that a vital protection and declaration of dignity for both women and their unborn children has been removed from the Irish constitution. "The idea that women have won today because they might have the choice to end their unborn child's life is too small and sad a vision. Already eyes are turning to Northern Ireland. "Democracy and devolution must be respected and the people of Northern Ireland must not have legislation imposed upon them, from either Westminster or Dublin."